All M2M amplifiers and repeaters listed below are compatible with your Chatr service. Chatr M2M Signal Boosters for use in ATMs, lotto & vending machines, remote monitoring systems, etc. Chatr is one of the largest Canadian wireless telecom service providers, serving hundreds of thousands of households and businesses all over Canada. Chatr is a well-known telecom network owned by the Roger Communications, and has been in business for more than six years. It is continually soaring in terms of subscribers of cellular phone service because the pricing is competitive and the service works within specified geographic areas. The company offers four monthly plans that can be set-up by either debit card, visa card, or master card. They provide a convenient option for ‘automatic credit card payment’ (auto-pay). These payment plans are ideal for small and large businesses that use the service for M2M applications. Whether you’re going to make an M2M deployment in ATMs, vending machines, Lotto Machines and remote monitoring to name few, Chatr makes it possible for you. However, your machines may have difficulty connecting without a good M2M signal booster for Chatr network. SIM cards used by Chatr are compatible for both HSPA+ and GSM devices be it 3G and 4G, which are specially designed to be applicable for Rogers Wireless. Since the society revolves around machines and devices that communicate back & forth to carry out purchasing and payment process using devices involving data transfer and connection, it is critical to maintain a good connection in any necessary conditions or any type of weather. Therefore, having an excellent Chair M2M signal booster to amplify and expedite any M2M process is one of the very important considerations that shouldn’t be taken for granted by any Chatr subscribers looking to use M2M services. Security 4G is compatible for both 3G & 4G LTE signal, which is perfectly designed for maximum security data connection intended for M2M transactions. This specially-designed signal booster also comes with security system compatibility. Some security applications may be in the form of a door entry system, alarm system, or other security environment. Compared to other boosters, Security 4G has a robust physical design, ideally intended for M2M (machine-to-machine) installation. This signal booster for M2M comes with secured method of communication and maximized amplification for data transfer, making any wireless transaction faster and easier. Once you have installed the signal booster, you will see a dramatic increase of bars in the computer display if available. It maximizes amplification of data download and upload speeds. Since M2M installation typically involves connecting vending machines, ATMs, cash dispensers and other equipment that need a direct 3G connection to function, having a secured signal booster is important for such kind of processes. Good thing there’s Signal 3G M2M booster which is ideal for 3G connectivity. It is suitable for use even on areas where cellular signal is extremely low. This signal booster is readily applicable for CMDA modems and other equipment, and comes with a 12 inches long magnetic antenna for greater amplification and easy installation. Once installed, the signal booster will significantly increase the connectivity of the device as indicated on its bar display. This M2M signal amplifier comes as part of a booster kit including the necessary cables that are required in order to fit the device into place and a mounted antenna for better signal reception. Security 3G signal boosters are also compatible to work with any type of antennae that can be easily connected to the device. The direct connection booster kit works with any type of M2M installation environment. This latest M2M signal booster product has been specifically designed to provide a maximized performance for M2M scenarios, especially on 4G signal. This high-end device works well in a bi-directional fashion, thus making it great for both inbound & outbound communication. 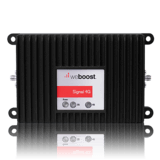 This specialized signal booster by weBoost can be used for any type of equipment which requires a 4th generation signal. Since Signal 4G has a compact design, the signal booster can be easily fitted in confined spaces, and can also be fitted out of site when needed with a wire run to the device. This signal booster can also be installed in remote areas where signals are low or limited. Just install the signal booster in place and you will be provided with optimized amplification for M2M environment. Moreover, the speed of data transfer will be carried out immediately, without any downtime or hassle in the transmission or connectivity. Signal 4G M2M Signal Booster Kit is also IC and FCC certified, thus, adheres to high-quality standards. Customers don’t need to suffer from connection losses, low quality data transfer, dropped calls or a slow internet connection. The Signal 3G 470209 M2M booster kit is highly reliable to use with different devices that utilize 3G connection in transmitting data. Some of the M2M operations where this device is compatible include: Cash dispensers, fleet management, vending machines and other commercial equipment where good amplification is very important. This special product of weBoost is ideal for confined and small spaces. A complete package consists of power supply unit, cables, 4 inches mini-magnet antenna and an instructional manual on how to install and operate the device. Signal 3G 470209 M2M booster is also great for both outbound and inbound transmissions from one machine to another. With Signal 3G, rest assured that the signal will not drop frequently nor get lost, thus, assuring its security quality. This special device is also suitable for a wide spectrum of equipment that uses CDMA modem connection. These factors greatly help to improve the overall performance of communication, and also makes the device even more efficient. Compared to other M2M signal boosters, Signal 4G 470219 provides an utmost superiority in terms of its features. Same as 3G and 4G version, this also works best for both inbound and outbound transmissions. This M2M signal booster can be connected to LTE modem so as to provide 4G signals, booting to almost all M2M scenarios. This kit is also reliable for use with Vending Machines, ATM machines and other equipment that requires a good 4G connection. The signal booster kit comes complete with all the necessary items needed to get the booster up & running, which includes the amplifier itself. Since it comes with an easy installation feature, setting up the device can be done in a DIY friendly manner. Signal 4G 470219 is compatible with any LTE capable modem, and with other wireless networks aside from Chatr. The signal booster can also be used using other antennas for any M2M installation. If the user is carrying out a data transfer using M2M transaction in a remote area, Signal 3G 470309 can significantly improve the amplification of the M2M scenario even in low signal locations. This specialized signal booster provides dual-band amplification, making it an ideal choice for 3G HSPA+ connectivity. Signal 3G 470309 comes in a compact and lightweight design, and can provide optimized and strong signal to, and from your equipment. Rather than the usual standard power adaptor, this excellent signal booster comes with a mini USB connector that is located on one end and with a terminator point on the other end. Scroll back to the top to choose the most appropriate Chatr M2M signal booster for your needs.